You've probably heard about the study that has been released, stating that tightly fastened crank nosebands cause distress and pain to horses. You're probably not too worried as it is a very poorly done study. But, the legitimacy of this particular study aside, you should be worried. You should be worried because this study has been discussed on ABC News. You should be worried because it is unlikely that anyone will be asserting that it isn't the equipment, but the rider who causes pain. You should be worried because this will quite possibly be the final blow to equestrian events in the Olympics. 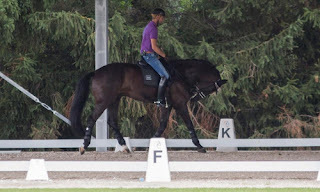 Judging from your desperate scramble to make these events more interesting for TV by things such as proposing shortening the international Grand Prix dressage tests, suggesting name changes to events to make it more understandable to the public, adding more tricky obstacles so eventing is more exciting(re: dangerous), etc, I assume this interests you. All of these things in an attempt to keep us on TV. All the while ignoring the real problem. Forgive me, I don't mean to berate our reigning organization so unfairly, but I must confess, your actions in previous years have been...disappointing to say the very least. 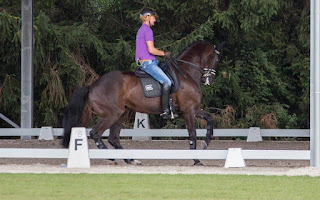 Maybe it's how time and time again, influential dressage riders are caught riding with their horses' heads forced to their chest and you look the other way due to lack of 'proof'. Maybe it's how you assure us all that you care deeply for the welfare of the horses, how you will look into allegations with the utmost care, but it was mere weeks ago that a rider was filmed repeatedly jerking and spurring her horse after he tripped and you accepted her half-hearted apology and the excuse of 'I thought we were going to fall and I wanted to wake him up'. Maybe it was your decision to not implement the objective Taper Gauge to ensure nosebands are adjusted in accordance with the rule that states that a noseband should never be tight enough to cause injury. And yet, when presented with the opportunity to enforce this rule, you found it too invasive. I agree that we should not punish riders unfairly and that we should take care to view all parts of a story before condemning anyone, but that's the thing. In recent years, I have yet to see you condemn even the most obvious cases of abuse. That's why so many international warm up rings are starting to ban cameras and harass journalists. It makes a person wonder what you're hiding. Except that we all know. You're hiding the flagrant use of rollkur under the new name of LDR(low, deep, round). You're hiding your blatant bias toward flinging forelimbs instead of soft, correct riding. You're hiding yourselves lest we see the money and the politics that keeps this industry filled with people who couldn't care less about who suffers, so long as they win and so long as you hire judges who let them. Why else would Totilas be trotted in the soundness jog three times, yet allowed to continue on to limp his way through a Grand Prix test? Why else would 60+ photos of a certain Danish rider with his mare's nose firmly against her chest get no reaction from you because photos, even that many, are only a moment in time? Why else would voiced concerns be ignored, brushed aside with the assurance that 'we've just had a meeting'? Why else would course designers continue to make courses filled to the brim with obstacles intended to frighten, confuse, or trick the horse, despite the ever increasing body count of riders killed in the cross country phase? Why else would you refuse to make anyone take responsibility for their actions? And, so now, we arrive here. I'll be honest. I am not a fan of crank nosebands. This is because I have rarely, if ever, seen them used properly. In proper use, it's essentially just an extra padded strap of leather. In it's most abused form, it is used to shut the mouth of a horse so that no one sees it gape against the improper use of the bit, specifically the curb. The study released is poorly done. But I have no doubt in my heart that there will be other studies, ones that are better, that will show the same evidence. Study or no study, maybe the reason televised equestrian events are on the decline is because the public dislikes seeing horses paraded around in a facsimile of harmony. And with this becoming a storyline, it won't matter that there are riders out there who ride and train compassionately. The public is known for its tunnel vision. I do believe if changes are not made to enforce the established rules and make the safety and welfare of horses and riders a top priority, that we will see events such as dressage, showjumping, eventing, etc go through death throes as an Olympic sport. Perhaps we already are. And it is because we, as individuals and as organizations, have seen evil and allowed it to continue. Willful ignorance at its best and brightest.